Use TB2QA7G to reference this item. This coin’s mission is to raise bike awareness; riding safely takes everyone’s cooperation and patience. It's a painful fact of life that motorcycle riders are 30 times more likely to be killed in a crash than any other vehicle drivers. 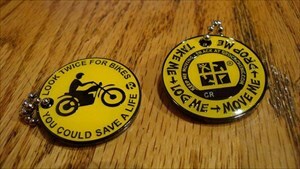 This coin is dedicated to alll bike riders who have died, their family and friends miss them greatly but they will not be forgotten. Doug H. was a very good friend of mine as was Tod Phillips to Rockin Roddy, both were lost due to motocycle accidents, please watch out, we don’t want to lose anymore friends. 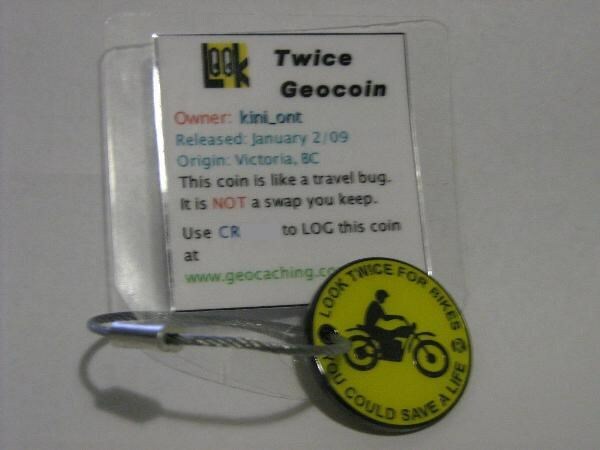 In logging this coin please feel free in remembering someone you lost, or place a safety tip to remind yourself and others that we all share the same road. I thought I already wrote about this one getting lost in the forest. If you don't remember I was the person who fell down going back to the car out caching for "lonely arbutus". The con dropped out of my pocket and I could not find it after retracing my steps. Sorry about that... my apologies for losing it and forgetting to tell you. Everyone has someone to remember. Will move this West soon. was given this coin to start moving up island. will put out in a few days,seen one like before.